Go beyond “A is for Apple” with an alphabet book that builds character. 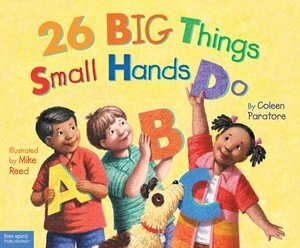 As children learn and review their ABCs, they discover positive actions they can perform with their own small hands—like applauding, building, giving gifts made with love, helping, planting, recycling, and volunteering. These are simple things even toddlers can do for themselves and others. The message throughout is that everyone, no matter how young or how small, can make a difference in the lives of those around them. The book ends with big hands clapping. A warm, affirming book for the home, childcare, or preschool.